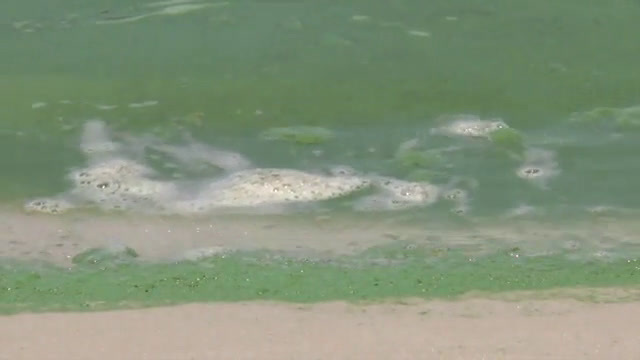 All eyes were on southeast Florida's St. Lucie Estuary in 2016 as it received national attention due to beach closures on the Fourth of July weekend from the massive amounts of toxic green slime that covered parts of the 7-mile-long inlet linked to a coastal river system. Microcystis aeruginosa - a freshwater blue-green alga that can produce toxins - wreaked havoc on this important ecosystem prompting researchers from Florida Atlantic University's Harbor Branch Oceanographic Institute to get to the root of the problem. This bloom event followed a one-year watershed to reef study. Results of the study, which uncovered a major source of nutrients driving the harmful algal blooms, stink. 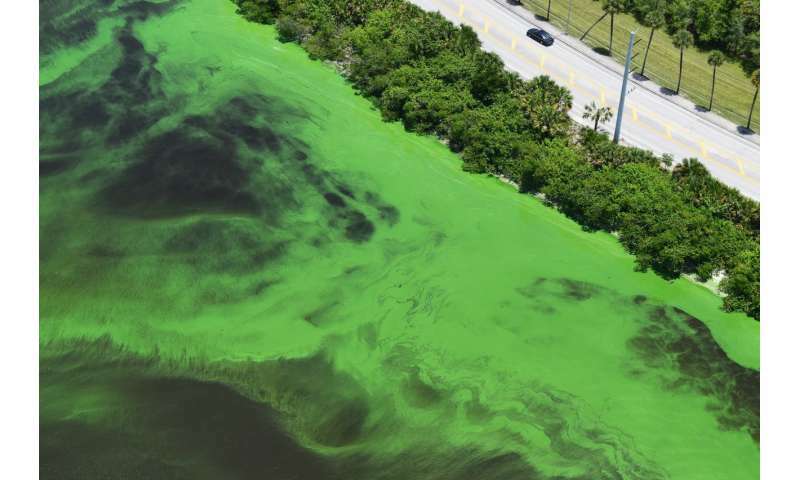 Contrary to the widespread misconception that periodic discharges from Lake Okeechobee alone produced these harmful algal blooms, FAU Harbor Branch's study provides multiple lines of evidence that nutrient sources in the local basins, including on-site sewage and septic systems, contaminated the St. Lucie Estuary, in particular its urbanized sections as well as its watershed. Results of the study are published in the journal Harmful Algae. "It has long been thought that the algal blooms found in Lake Okeechobee, which are caused by pollution such as runoffs from farms, were solely responsible for driving the blooms and their toxins in the St. Lucie Estuary," said Brian E. Lapointe, Ph.D., lead author of the study and a research professor at FAU Harbor Branch, who recently presented these findings at the ninth U.S. National Harmful Algal Bloom Conference. "We wanted to investigate the role of on-site septic systems, which have previously been overlooked." The combination of the freshwater conditions in the estuary, combined with wastewater nitrogen (ammonium) enrichment, resulted in a "perfect storm" bioreactor that supported growth and toxin production in Microcystis. These particular freshwater Microcystis blooms (and toxins) are increasing in estuaries and coastal waters around the world and are expected to expand in scale and intensity with global climate change. Some of the most chronic blooms are occurring in Lake Erie, Cape Fear River, Patos Lagoon Estuary in Brazil, and Lake Taihu in China. 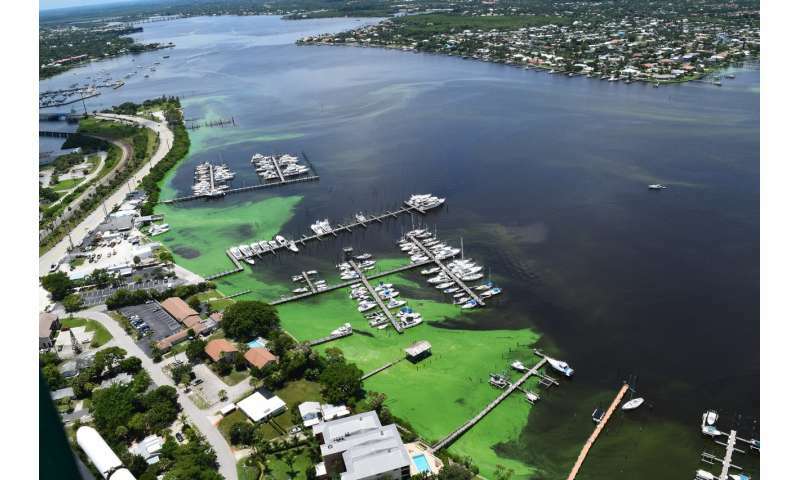 "In the St. Lucie Estuary study area, septic-to-sewer programs, which include nitrogen and phosphorus removal through advanced wastewater treatment, could help meet this challenge and mitigate future harmful algal blooms," said Lapointe. "These improvements within the local watershed combined with increased storage and nutrient management north of Lake Okeechobee would collectively improve the conditions in both the St. Lucie Estuary, adjacent portions of the Indian River Lagoon, and the nearshore reefs downstream of the St. Lucie Inlet while better protecting human health."